Congratulations! If you’re looking for the best pomade for you, it means that you care. You care about looking good, you care about smelling good. That’s more than can be said for 90% of guys out there. A good haircut and a pomade are the fastest way to be the kind of bad boy that makes girls swoon. Let me help you find the best pomade for your needs! 1 The Best Pomade on the Market in 2018? 3.2 Now we crack open the pomade. 3.3 Then you comb your hair. 4.2 Now we crack open the pomade. 4.3 Then you comb your hair. 9 Conclusion – What is the Best Pomade overall? The Best Pomade on the Market in 2018? After many years of experience as a barber, I’ve used pretty much every pomade on the market, from vintage to modern ones, water-based, oil-based, you name it. So, I figured I’d put my experience to good use, and I’d answer a few of the questions that I get all the time. The most common of which is, of course, which one is the best pomade for men? 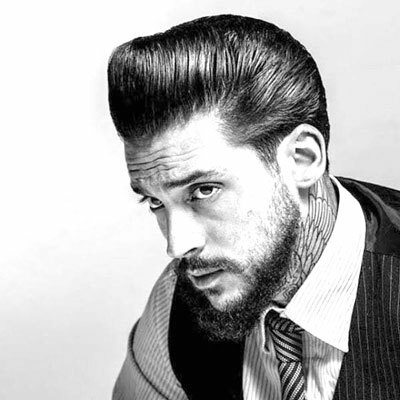 Pomade is a substance that you put in your hair to style it. It doesn’t dry out and harden like hair gel does, which means that you can recomb it and restyle your hair throughout the day. Most pomades also provide a nice sheen to your hair. While most pomades are oil-based, there are also water-based pomades. In general, water-based pomades are softer and they hold up better in hot weather. I personally use a oil-based pomade during the winter, and I switch to a water-based pomade when it’s hotter, especially at night, when it’s likely to get more humid. There is no best pomade for all occasions, and part of the fun is experimenting! Can be kept in hair days, lowering the cost further. Loss of hold in hot climate. Little to no shine (this could be a con for some). Great hold, even in hot climates. Can be restyled throughout the day, just add a little water. Some water-based pomades may harden like gel. You may need more product to get the same hold as an oil-based pomade. Then there are also pomades with wax in them, usually beeswax. These pomades are usually hybrids, containing wax and petrolatum. The main advantage to wax-based pomades is that they usually have really strong holds. The downside is that they clump up and are harder to spread evenly in your hair. Also, a lot of wax-based pomades tend to flake. Water is what makes them flake, so if you live in a place with a humid climate, you’ll get dandruff-looking white specks in your hair. For dry/cool climates though, they could be your staple. Protip: Wax based pomades are harder to restyle because they clump up when water is added. If you get clumps, just use a blow dryer to melt them before recombing. A lot of people who first start experimenting with pomades apply their product wrong, thus getting sub-par results. In some cases, these people are put off and never try pomades again, which is a darn shame if you ask me! So, this is how I use pomades. Although some people apply pomade to dry hair, I always start with damp hair: I get out of the shower, towel-dry my hair very, and I mean VERY loosely, and I let it air dry for a few minutes. When my hair is just damp, I will then comb it back. Now we crack open the pomade. What you wanna do is grab two fingertips worth of pomade, gently rub it in your hands until it’s all evenly spread, and then you gently work it on your hair. You wanna really spend time working all of the pomade in your hands into your hair. Then you comb your hair. I usually slick my hair back with the pomade, all the way back. If you feel like you need more product, you can add one more fingertip worth of pomade in your hair. Comb, and see if you’re good now. If not add one more, and so on. Most newbies make the mistake of putting too much pomade in their hair! Usually, two to three fingertips worth of pomade is all you need! If you put too much pomade in your hair, you will just waste product (and $$$), and you will weigh your hair down so much that it will actually be difficult to style it. What you wanna do is grab two fingertips worth of pomade, gently rub it in your hands until it’s all evenly spread, and then gently work it into your hair. You wanna really spend time working all of the pomade in your hands into your hair, especially if you’re using a heavy pomade. I usually run my hands on my hair from the front to the back with the pomade, slicking my hair back. If you feel like you need more product, you can add one more fingertip worth of pomade in your hair. Comb, and see if you’re good now. If not add one more, and so on. Every now and then, rub the pomade with your hand from the back to the front, so that you get the product on the roots as well as the top of your head. From here, you have a few different hairstyle options. There are a few awesome hairstyles that you can achieve with the best pomades. So, I’m just gonna illustrate how to style a few different ‘dos. 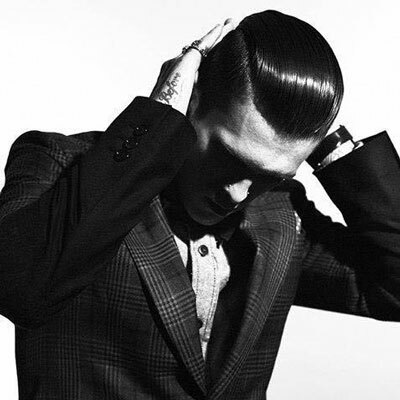 If you like your hair just slicked back, simply add the pomade thoroughly, and then slick it back with a comb. If your hair is wavy or curly, you may need a medium to strong hold pomade. Also, it’s important to use the right comb: for the best results, I’d recommend a good quality military brush. The teeth (or bristles) need to be small, so that you don’t get splits in your hair, or oversized brush strokes. The hard part is a very sleek look that’s made a huge comeback in the 2010s. Some people call it an “executive contour”, but that sounds too douchey to me, so I just call it the hard part. Cause that’s what it is. To achieve a great hard part, you need to have a great haircut, no two ways about it. Pomade alone won’t allow you to pull off this look. BUT you need the right pomade to really bring this hairstyle together. To style a hard part, you will slick your hair back like above, but then you’ll use a straight long comb to make the part. I like to use the coarse side of the comb at first, and then finish it with the thin side. Make the part on the side that flows best naturally (for most men that’s on their left side). Put the comb just above where you want the part to be, then comb it towards the other side, while following the comb with your free hand. 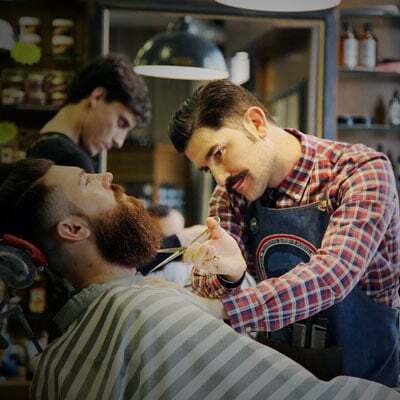 The free hand will spread the pomade on the part, and will keep stray hairs from going back down. Look at your part, and see if it’s straight. If not, simply use the tip of the comb to pick up the stray hairs from their roots and comb them up or down until you get a nice, straight line. It will take a bit of practice, but eventually you’ll get near-perfect hard parts on the first or second try. The pompadour is a great 50s style hairdo that’s still very popular, especially thanks to the whole rockabilly phenomenon. 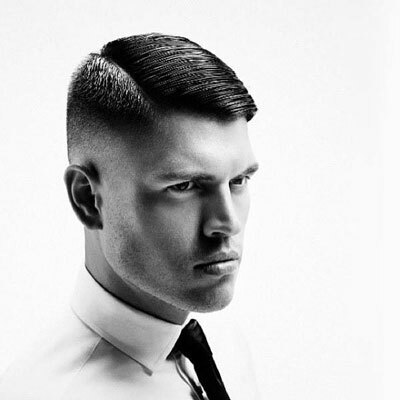 To achieve a pompadour, you’ll need your hair fairly long on top, and shorter on the sides. To style a perfect pomp, you need to do all of the steps above, but then, instead of just combing your hair to the side, you will comb the front of your hair backwards. If the pomade you use is strong enough, you’ll get some nice volume on the front of your hair. To adjust the curve of your pomp, put your free hand above the curve, and then brush the front upwards, until you’re happy with it. For a real 1950s-looking pompadour, I recommend starting with a heavy pomade to get a lot of structure, and, when you’re done, using a dime-sized amount of really lightweight pomade on top, to get that wonderful sheen. Some people don’t like the sheen, but, in my opinion, the sheen is the soul of the pompadour . Pomades are not hair gel. If you want something that you wash out every day, you’ll need to stick with water-based pomades. Conversely, if you want to be a real greasehead, you’ll benefit from oil-based pomades, because you can do what I refer to as The Buildup. What I mean is that you can use heavy pomades Sunday through Wednesday. Then on Wednesday you start using medium weight pomades, so come Friday, with a little bit of water or a top coat of light pomade, you’ll get the perfect sheen. This is a bit extreme for a lot of people, but it’s the only way to get a perfect pomp on the weekend. Also note that I’m not advising poor hygiene. I shower every day and I wash my face and forehead regularly. You don’t want the pomade dripping down your forehead and giving you acne. Just sayin’. Now that you know about the different types of pomades, I think that it’s actually more useful to categorize pomades by weight. You see, pomades are not all made equal. There are thick pomades that are engineered for maximum hold, and then there are pomades that are super light, providing a lot of sheen, for that nice 1920s Hollywood star look. It all comes down to preference. So, I’d like to illustrate what the best pomade is for what use. 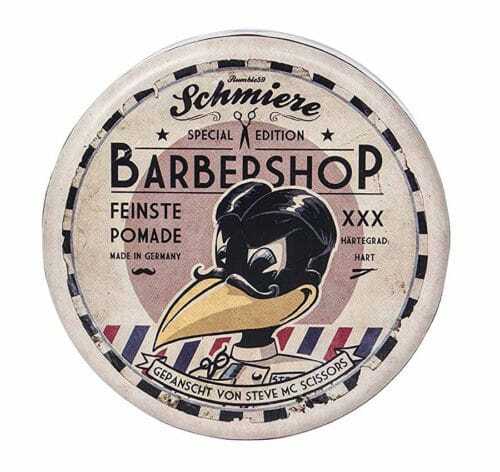 The Schmiere Knuppelhart pomade is a nice heavy weight pomade. Even though it’s super hard when you scoop it out of the tin, it’s actually easy to work into your mane. A little will go a long way and the hold is super strong, without giving you helmet head. The hair remains malleable, unlike most wax based pomades. Not a lot of sheen, but that can easily be fixed with a top coat of light weight pomade. 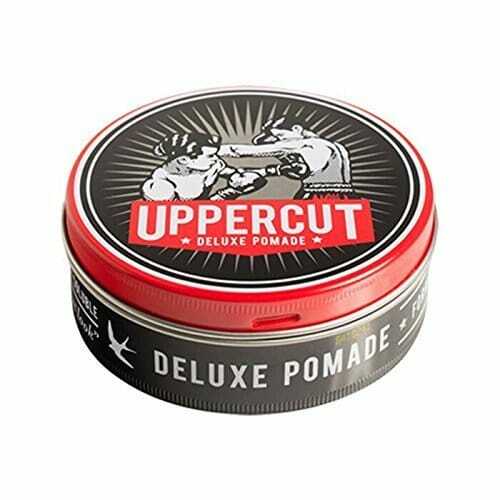 The Uppercut Deluxe is a nice water based heavy pomade that will still give you great shine. This stuff is strong! Grips your hair, keeps your pomp high and forward, while still being easy to wash out with shampoo. It dries a little bit but it won’t set hard. It’s just a tad hard to work with, but if you take your time, Uppercut delivers. 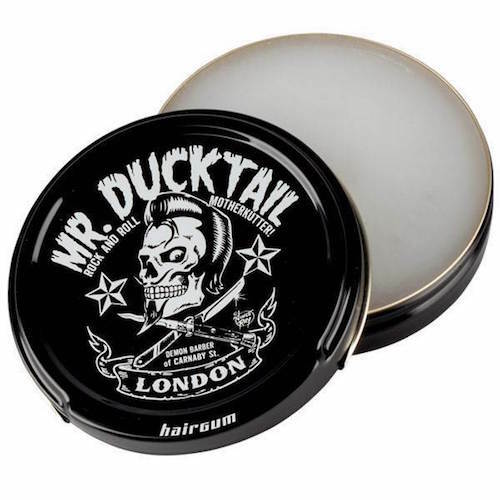 Mr. Ducktail is a one of my new favorite pomades. It’s light and oily, while still having some nice hold. It smells good, and feels good. This pomade goes in your hair super easy and it’s got the right amount of hold for a pomp, no more no less. Two things, though: this pomade is super hard to wash out. And you’ll use like a 1/4th of a tin every time you style your hair. So beware you may be needing quite a few tins fast. 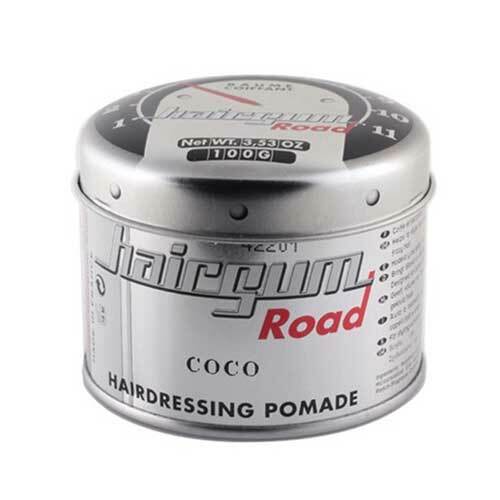 The Hairgum Road line is a great pomade. It comes in three different scents, and they all smell amazing as far as I’m concerned. This pomade feels light but holds like a medium. It’s got a really nice sheen that’s not too oily. This is a great pomade to pick up if you wanna work with the natural waves in your hair instead of combing them stick-straight. Royal Crown is one of the iconic pomade brands. Johnny Cash thought this was the best pomade ever made, need I say more? 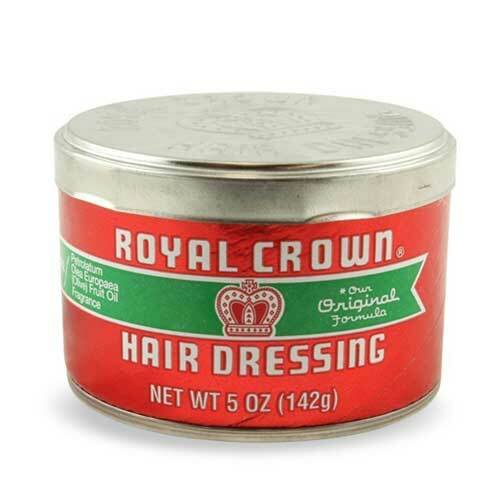 The Royal Crown Hairdressing is a very light, very greasy pomade. It’s perfect for 1920s slicked back Hollywood hairstyles. I only ever use it as a top coat after applying a heavier pomade for structure: the Royal Crown alone provides little support if you want to pomp high and forwards. 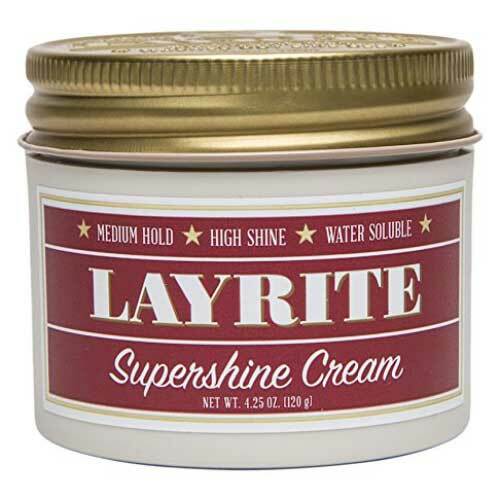 I decided to feature the Layrite Super Shine Cream because it’s a very valid light pomade that is water based. This means that if you want the sheen without the greasiness, this is the best pomade for you. It’s got very little hold, so it works best with short hair. 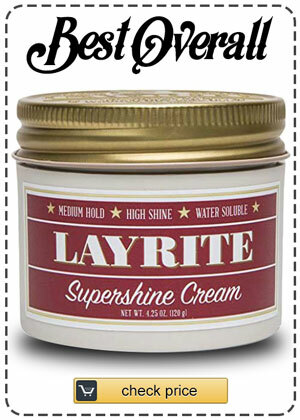 The Layrite Super Shine Cream provides very natural sleek finish, and doesn’t harden at all. I use this pomade regularly. One thing that’s worthy of note is that I haven’t added reworkability and smell in the factors for these best pomade choices. The reason is that, if a pomade hardens and is not reworkable, I just won’t add it here: the ability to recomb and rework your hair throughout the day is, in my opinion, an essential factor of choosing a pomade over, say, a hair gel. If a pomade hardens, it ain’t a pomade! And as far as smell is concerned, it’s simply too subjective.. I hear people talk about how good Suavecito smells, and yet, I’d never use their pomades because the smell is just overpowering for me. Having that on my head the whole day will give me a migraine. So, all of the pomades in this list have nice, subtle smells. If you’re concerned with smell, I simply suggest that you visit a local retailer and you sample the smells. Or go to a barber that stocks the kind of pomade you’re interested in, and ask for it at the end of your haircut. Most of my clients have found the best pomade for them this way. Conclusion – What is the Best Pomade overall? The best pomade is the one that does what you want it to do! So, I hope that now you have a better idea as to what each pomade does, and hopefully you can find the best pomade for your specific needs. If you want a catch-all recommendation, I would say that any Layrite pomade is a great way to start, because their pomades tick all the boxes while still being water-soluble, so super easy to wash out. The Super Shine Cream is an excellent purchase. If you need more hold, I would go with something like the Layrite Super Hold. Finally, if you don’t want any shine, I’d pick up the extremely popular Layrite Cement Clay. Hope this article helped you! Don’t forget to check back for more reviews and guides!